405nm Lasers provide a powerful, narrow-band, pin-point source of monochromatic UV light to cause fluorescence in oils. The resulting spectra continues to be investigated as a means of contaminant detection using the PLab spectrometers. However, with hopes for a more compact design, new high-power UV LEDs have been proposed as an alternative to the pocket laser. Unfortunately, LEDs are relatively unfocused, have a very wide spectral bandwidth, require significant power supply current and, with the specific device tested for this note, still appear unsuitable for the task. @Jeff recently found an inexpensive, high-power 405nm UV LED ( https://publiclab.org/notes/warren/01-05-2016/testing-high-brightness-405nm-leds-in-fluorescence-spectroscopy-of-oils ) which provided an easy means for performing some comparative tests using my OTK-V3 Proto hardware ( https://publiclab.org/notes/stoft/01-19-2016/otk-proto3 ). While not linear with applied current, the intensity can easily be controlled. However, the wide bandwidth of the LED, as opposed to the laser, is clearly a disadvantage as the 400-450nm data will be potentially corrupted by this wide signal. Also note, that this plot suggests that significant current will be required which is beyond the capability of most USB ports. The next plot (below) shows a comparison of the fluorescence spectra of several OTK test chemicals. The negative influence of the LED's broad bandwidth signal is clear. What is also interesting is that the LED's spectral intensity within the fluorescence spectra, seems variable with the type of chemical. My guess is that scattering is the most likely cause since the LED source has a high dispersion (120-deg viewing angle); unlike the laser. The last comparison was of an ND-Crude sample, exposed by the LED and then by the laser. 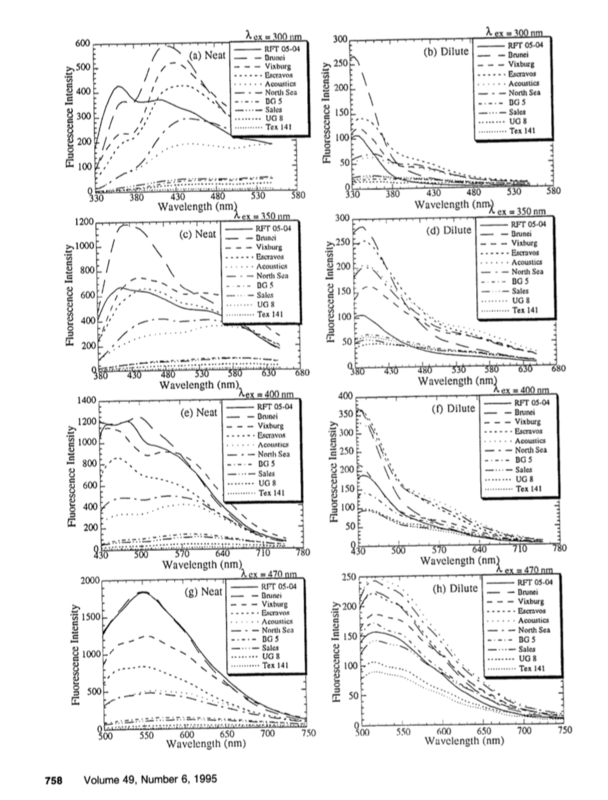 Admittedly, there is some difference in UV exposure intensities, but looking beyond that difference, the impact of the LED on the fluorescence spectra seems obvious. The fluorescence spectra are simply different; which might be related to the oil molecules being excited in different modes than those from the monochromatic laser. The device is described as a 3W "Hyper-Violet" LED "grow light" with 640-680mW of output power. The 405nm UV pocket laser is rated at 5mW but my observations during testing show that comparing single-value power ratings is not sufficient. Clearly, the LED's ability to stimulate fluorescence was not 100x that of the laser. However, the LED's rated output power is distributed over at least 25nm of bandwidth and it is presently not possible to identify the relationship between the fluorescence stimulation efficiency of a monochromatic source vs a broad-band LED source. However, my observations suggest that the broad-band LED source is much less efficient at producing fluorescence. This is likely a product of energy distributed over a wide bandwidth and inherent dispersion and scattering. This testing suggests that relative to output power level, LEDs appear to be much less efficient at stimulating fluorescence in the cuvettes than a UV pocket laser. This is likely a product of energy distributed over a wide bandwidth and inherent dispersion and scattering. There is some evidence that the generated fluorescence spectra are only similar between the LED (broad spectrum) and Laser (monochromatic) stimulation. I believe that most commercial devices use one or more monochromatic sources. Significant, controlled current would be required which is generally beyond the capability of most USB ports. LEDs are doide semiconductors with a higher, and more variable, voltage drop when voltage is applied. Therefore, what is of interest is controlling the current by providing a variable power supply with a series resistor. Without the resistor, the supply voltage would be very difficult to control, especially above 50mA, and so damage to the LED is easy. This specific diode has a max current limit of 750mA -- though my bench supply was limited to about 550mA for testing. The current limiting series resistor was 3 ea 10 ohm, 1watt resistors in parallel for about 3.5 ohms which was reasonable for my 20V adjustable supply. Be aware that the heat sink the LED is mounted on warms to about 90-deg F with 500mA of current. This is not too high for the device, but in close proximity to the sample, the cuvettes get warm very quickly. However, the wide bandwidth of the LED, as opposed to the laser, is clearly a disadvantage as the 400-450nm data will be potentially corrupted by this wide signal. Also note, that this plot suggests that significant current will be required which is beyond the capability of most USB ports. I'm afraid I have to disagree here -- I've been running mine at intensities up to clipping the color channels off of my laptop at the event @matej organized, as well as off of a 1-cell portable lithium-battery-based USB charger without issues. The negative influence of the LED's broad bandwidth signal is clear. It doesn't seem clear to me, though. Can you elaborate? Are the plots you posted there all with LEDs? And are you primarily talking here about the overlap of the LED peak with the shorter-wavelength data from fluorescence? If so, I agree that it's a potential problem, but there's been some good discussion here about using even lower wavelength LEDs to reduce overlap, and we've found affordable LEDs at 365, 385, and 395 nm. It'll be interesting to see if this addresses the overlap issue. What is also interesting is that the LED's spectral intensity within the fluorescence spectra, seems variable with the type of chemical. My guess is that scattering is the most likely cause since the LED source has a high dispersion (120-deg viewing angle); unlike the laser. That is interesting! Reducing wavelength overlap would presumably reduce this issue as well. the impact of the LED on the fluorescence spectra seems obvious. The fluorescence spectra are simply different; which might be related to the oil molecules being excited in different modes than those from the monochromatic laser. I agree that the impact is pretty clear, and that they're different, but it's not clear to me whether the difference will have an effect on the relationship between spectral red-shift and oil weight. This is what I'm most interested in seeing, and I believe @ethanbass has agreed to test it out. I think you have the OTK samples as well, so if you'd like to post that too, I'm very eager to see it! A comparison of different oil weights using LED vs. laser. Sorry, I'm not following here -- are you referring to the wavelength overlap, or another kind of degradation? The key I want to understand in your analysis is whether you are solely concerned with wavelength overlap, or if you're additionally concerned about there being a less distinct emission spectrum due to the broader wavelength of the excitation light. Wavelength overlap could be addressed with a shorter wavelength LED, but broader emission would be harder to address. That said, even that would not necessarily affect red shift, which is the metric we've been using to grade oils. It could, however, make matching based on comparison of spectrum shape more difficult, which is, I believe, the approach @ygstcu is taking. In conclusion, I think it's premature to say that LEDs are unsuitable, and that further research is required. I do think that exploring alternatives is good, however -- and 405nm laser diodes are available, which would let us put an equivalent laser to the laser pens into a more stable case such as the cuvette frame under development. These are harder to source for regulatory reasons, but are available at similar price points. @warren - I don't think using a 395 nm LED or an even shorter wavelength is really going to solve the problem of the overlap between the light scattered from your LED and the light emitted from your sample. If you take a look at the literature, there have been several studies comparing the effects of excitation wavelength on the fluorescent emissions profiles from various types of oil. The findings are that the emission profile always shifts to the left, so that the leading edge of the spectrum lines up with the peak from your laser. You may be right that using a shorter excitation wavelength would superficially solve the problem of overlap, insofar as the sensors in the webcam would no longer be able to detect the region of overlap, but I don't see how this would actually solve anything. There would still be an overlapping region, even if you are unable to detect it. On the other hand, it also isn't clear to me that the small area of overlap introduced by the 405 nm LED is really all that bad. Maybe we can just crop out the area of overlap and still have enough data left over to make our determinations. @stoft - I'm looking at your final figure there, and to my eye, the shapes of the two spectra don't look all that different. Clearly, the fluorescence induced by the laser is more intense, but the broadness of the peak and its position on the spectrum look much the same to me. Ok, good points and questions. 1 - LED power. I note that you did not provide info about your circuit (i.e. series resistance) nor voltage at the USB output under load not the series current. It was my understanding that USB ports generally provide a maximum of 500mA (I think some may be much less). However, they may also include current limiters to prevent USB interface power supply damage so not actually supply 500mA (which is the current I found necessary for obtaining fluorescence signatures similar to those from the UV laser). There is also the issue of power supply design for the LED. Just assuming that if it "seems to work" off a USB port on one system is not a good design technique. For designing a "product" it is necessary to actually measure all parameters and be able to ensure that ALL USB ports it might be used with could provide the required power without any possibility of over-stressing the commercial device (ie. someone's expensive laptop). So, I stick to my statement of concern. However, at the moment, there is insufficient performance measurements to assign operating parameters to declare the required power supply design. Also, along these lines, I found that the voltage drop of the LED changes some with the self-heating when using the LED at higher currents. This suggests that to achieve a stable LED output level, as would be needed for measurements, the circuit would require a few added parts for a current control feedback loop to assure stable current during and between measurements. It is just not so simple as wiring any LED to any USB port. 2 - LED Bandwidth: Yes, I was largely referring to the additional errors in the 400-450nm region of the fluorescence spectra. Remember, most oil fluorescence spectra actually extend well below 400nm and having to chop off data below 450nm because the LED error begins to swamp the measurement differences one is attempting to perform is a problem. Recall that the spectrometer only has a 400-650nm detection bandwidth (with reasonable errors) so it is best to not throw any of that away. The 405nm Laser is VERY narrow band (much more narrow than what the PLab spectrometer can measure -- in all probability, if you measure the PLab FWHM bandwidth using the 405nm laser, that will essentially give you the resolution bandwidth of the PLab hardware.). Also, though I do not have much hard data, there are indications that the wide-band energy of the LED does not create the same Fluorescence spectra as the monochromatic laser. I think this would be expected as commercial devices sometimes use more than one UV wavelength laser source to improve diagnostics. Considering the early proto development stage of the PLab OTK hardware and analysis, I see the LED alternative as potentially adding additional complexity to the challenge of spectral repeatability and analysis. 3 - Oil weight and wavelength shifts: Yes, some of my curves in my OTK analysis research note ( https://publiclab.org/notes/stoft/01-26-2016/otk-proto3-analysis ) do show the wavelength shift and I also have a plot of that shift looking at both the "peak" and the "centroid" of the peak. Yes, I'd agree that appears to be evidence that oil weight, type and concentration cal all exhibit some shift -- but that shift is clearly not linear. In addition, as my OTK analysis plot (top of the note) shows, I could only find weak correlations -- the placement of my "colored rectangles". This relates back to the LED vs Laser question. My guess is that the LED, because it is wide band, is much more likely to stimulate additional fluorescence modes. This could be an issue if you think about the shape of the fluorescence spectra. When illuminated with a monochromatic source, the spectra is still broad -- largely, I believe, because the single wavelength, when stimulating the huge variety of molecules, produces a large array of fluorescence "peaks" which overlap to produce the broad spectra you see. (i.e. instead of single-wavelength spectral spikes). If each molecule had it's own unique wavelength, the analysis task would be much much easier. Instead, it's a muddled mess of noisy spectra -- all from just a single wavelength stimulus. Now, consider a noisy, broad spectrum source (the LED) -- my intuition suggests that this issue can only get more complicated, not less, and likely includes non-linear relationships. 4 - Scattering: Sorry for the confusion, I was mostly referring to my observation that when using just water, the nature of scattering from the diffuse LED source shows a strong 405nm LED signature. However, when observing oils and fluorescence with the LED, that broadband 405 peak can be much smaller. Also, the same 405nm LED peak appears at various levels in the spectra depending on the sample type. I concluded that, unlike the Laser, the LED source has significant variability to the source UV energy in the test spectra (and, i.e. variable additive error which is an additional complexity) which is much harder to remove than the vary narrow band laser signature. In my OTK proto, I was easily able to align the lasers' beam to minimize scattering which directly enhanced the SNR near the UV end. I saw that as a clear advantage because it allows getting much closer to having a full 400-650nm spectral width to analyze and you'll need all you can get. 6 - What I said was that I found that the LED I tested (the one you'd found) to be far less suitable to observing oil fluorescence spectra than the OTKs 405nm laser and I identified some issues and potential issues that will exist with using an LED which would not be there with a laser. I'd agree that it's still too early to quantify all the performance parameters of either LED or Laser. However, after some simple comparative measurements, I wanted to clarify what I saw as some muddy water surrounding the concept of swapping a laser source for an LED source. It's not a simple swap. While their center wavelengths may be similar, they are not an equivalent class of device and oil analysis, even with the laser, is itself still far from well understood. Oh my goodness, I realized that I have always assumed that fluorescence emission wavelength was relative to something inherent in the chemical structure, not based on the exitation wavelength! how much data free of overlap do we need, and how might we measure or quantify that amount? does intensity of emission vary with exitation wavelength? https://publiclab.org/profile/ethanbass - Thanks for your comments. As to your last note about my final plot: What I see is the depth of the "notch" between the 405nm source and the fluorescence broad peak; relative to the broad peak. The LED plot "notch" is not nearly as "deep" as the "notch" in the laser based spectra. I see this as evidence of the sever influence the LED's broad spectra has on the fluorescence spectra -- and worse yet, it is difficult to subtract out the source spectra while keeping resulting errors low. (Also, I see a significant difference in the "shape" of the two fluorescence spectral peaks -- which I consider to be important from a potential analysis perspective.) You're right though, that the broad fluorescence "shape" is roughly similar. However, I'd like to see sufficient control and stability of the hardware to actually extract more data from the fluorescence spectra than just general shape or peak center. RIght, Jeff, those are good questions and I'm not a Chemist -- I'm just extracting from what I glean from the web. But I think it would be good to find some good technical discussion about the multi-spectral issue so as to place some bounds on the issue; if it's significant. Some of this comes from descriptions of commercial devices -- i.e., if someone builds hardware, they must have a reason. There appeared to be a limited number od stimulation wavelengths but I'd guess that has more to do with what sources are available, not that there are necessarily any "special" excitation wavelengths (tough some may be better than others). @warren & @stoft - It's important to remember that the range of fluorescent emissions is determined in large part by the excitation wavelength we use. If we are using a 405 nm laser, we are generally not going to see any light emitted below this wavelength, because emitted fluorescent light is generally going to have a lower energy (and a longer wavelength) than the light that is absorbed. Transitions where the emitted light is less energetic than the light that is absorbed are said to undergo a Stokes Shift. There are exceptions to this rule, but my understanding is that they are relatively rare. That being said, I don't see any reason to believe that the webcam's detection bandwidth is shearing off much useful spectral data below 405 nm. When you say "most oil fluorescence spectra actually extend well below 400nm," it is important to remember the role of your excitation wavelength in determining the range of a fluorescence spectrum. For evidence of this, just look at the figure from my above post. I still think you make a lot of good points in your note. Thanks for the details analysis, Stoft. @warren - According to the paper that figure is lifted from, you will get increasing fluorescence intensity (or quantum yield), as you increase the wavelength of excitation. I think this makes perfect sense because longer wavelengths of light are less energetic. The less energy you put in, the less total fluorescence you get. It appears that there is also an affect on the bandwidth of emission. I think it has to do with the amount of (collisional) energy transfer you are allowing for. When you use a shorter excitation wavelength, your excited chromophores have a higher probability of crashing into a chromophore and giving it enough energy to fluoresce. The more of this collisional energy transfer you have, the more red-shifted your spectrum is going to be, because each one of these transfers results in some energy-loss. The more concentrated your sample is, the more of these collisions you will have, so you get a greater red-shift. When you dilute your sample, you reduce the number of collisions and you get a blue shift. This explains the dilution effect we have been looking at. The authors of this paper say that "at short excitation wavelengths, there are significant variations in the spectra for different crude oils, particularly for the neat samples." So theoretically, we would want to use the shortest possible excitation wavelength so that we could distinguish between different crude oils. However, the detection bandwidth of our sensors if obviously going to be a factor here. To my mind, as long as the lower limit of detection for our sensor is stuck at 400 nm, a 400 nm excitation wavelength remains the ideal choice. If we excite at 400 nm, practically all of our fluorescent emissions are going to fall within the range that we are best able to detect. If we excite our sample at a shorter wavelength, the emissions are going to be shifted into the UV, out of the range where we are able to detect them. Aha; a very good description which explains things I'd read. I think it also directly supports my present contention that with a 400nm source and the fluorescence band down to at least 400nm, the best spectrum we can capture (to have the most data to work with) is when the source does not bleed into the shorter wavelengths. So, on the basis of the chemistry, a 405nm laser will provide the better option. I wonder if a 405nm laser module could be found (separate power instead of the pocket battery type) which might afford additional power levels for greater sensitivity. One more thing to consider is that our DVD diffraction gratings would probably filter out most of the UV light below about 390 nm, even if we had a sensor that could detect it. A lot of sunglasses are made out of polycarbonate (the same material in DVDs) because it is good at filtering UV light. If you look at this graph from an oculists website, the transmission of light through polycarbonate drops off sharply below about 390 nm. @gretchengehrke, can you help us w excitation emission wavelength questions? Gretchen is a chemist, so I thought she could shed some light on our questions about overlap and shorter wavelength LEDs. there have been several studies comparing the effects of excitation wavelength on the fluorescent emissions profiles from various types of oil. The findings are that the emission profile always shifts to the left, so that the leading edge of the spectrum lines up with the peak from your laser. (Downare and Mullins, 1995). My understanding, which Gretchen confirmed on the phone, was that fluorescence is based on an intrinsic property of the sample's chemical makeup, and a given fluorescence mechanism does not shift wavelength due to different excitation light wavelengths. Can we try to reconcile that with the Downare & Mullins paper? I've registered and they apparently have to review your account to approve it. Very non-open-access. Note: The article can be downloaded w/o signing up using the 'Download Full Text' button at the upper right of the image frame on the web page. From browsing the article, I'd agree that the individual contributors of fluorescence, which when combined produce the broad band spectral curve, do not vary their wavelength based on the stimulus wavelength. However, that does not preclude a variation in what percentage of each fluorescence constituent is activated as dependent upon the stimulus wavelength. Those are two entirely different effects. 1) Crude oils all generally contain the same (many) types chromophores (absorb light but do not fluoresce) and fluorophores (absorb light and fluoresce) but in differing quantities. 2) The chromophores result in quenching (reduction) the fluorescence from the fluorophores which affect dilute solutions more than neat (un-diluted) samples. 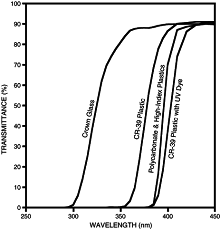 The variation in number and ratio of chromophores and fluorophores results in the specific fluorescence intensity for a given UV stimulus. 3) Collisional energy transfer between chromo- and fluoro-phores, which is a function of their concentrations, has a direct influence on the fluorescence spectra which is a function of excitation wavelength -- where longer wavelengths gradually decrease the spectral differences. At shorter (UV) wavelengths the spectral variation with stimulus wavelength is significant. 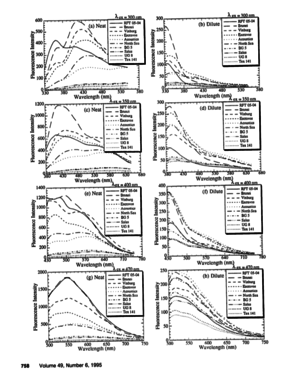 Below are graphs for 30nm, 350nm, 400nm and 470nm excitation wavelengths. 4) There is also a marked difference in spectra between the 'neat' samples and the diluted samples at each stimulus wavelength. This is very important when starting with an unknown, diluted sample. Below: 400nm neat and then 400nm diluted. Ah, thanks for the download tip. OK, that's really interesting to see that lower excitation wavelengths create more variable/distinct emission spectra. It does seem, though, that what Ethan had hypothesized -- that lowering excitation LED wavelength wouldn't get us less overlap -- isn't true, but that there are also other reasons why lower excitation wavelength is helpful besides overlap issues -- namely distinctness. @ethanbass -- i actually sent you one each of 385nm and 365nm LEDs, but I need to look up their specs for voltage, so don't try to plug them into anything yet. I'd love to see a neat and dilute spectrum of crude with 405, 385, and 365nm LEDs. Can you solder? I suspect we could solder the LEDs to a small board -- maybe even removing the 405nm one and swapping in the other, although it'd be a pain to have to switch back and forth. Note: Their UV source was a PTI LS-100 fluorescence spectrophotometer -- no longer sold. From a google books print, it sounds like a variable-wavelength device which allowed measurement resolutions of 3nm. So, it might not be laser-based, but clearly (from the article, the excitation wavelength could be controlled and, from the google books reference, the bandwidth was relatively narrow (within the resolution of the PLab hardware. Thanks, Dave, good to know. I'd sort of imagine it's a monochromator, like a reverse-spectrometer, using masking and a diffraction grating to generate wavelengths? BTW .... the comments about LED 'voltage' perspective do not seem inline with LED parameters. With LEDs, it's not the voltage, it's the current you want to control -- the LED voltage drop is only a result of the current which is set. If you use a direct connect between variable power supply and the LED, you are assuming the supply's current limit is part of the equation -- potentially an 'unlimited' supply of current should the voltage exceed operating parameters which can easily produce thermal runaway. At low voltages, you can 'get-away-with' a voltage source but really, LEDs should always be powered off a higher voltage supply with a series resistor and then measure / set the current to be within the LEDs operating range.